Very Good in Very Good jacket. 069109750X Bollingen Series XIX. In Very Good, mylar wrapped dust jacket. The Richard Wilhelm Translation rendered into English by Cary F. Baynes. Foreword by C. G. Jung. Preface by Hellmut Wilhelm. Very Good + in Very Good + jacket. 8vo-over 7¾"-9¾" tall. Hard Cover. Very Good +/Very Good +. 8vo-over 7¾"-9¾" tall. 24th printing. Prev. owner's small embossed name on endpaper. 8vo-over 7¾"-9¾" tall. 740 pages. Hardcover, no dustjacket. Fair condition. PHILOSOPHY. This is one of the earliest efforts of the human mind to place itself within the universe. This book of Wisdom eventually became one of the Five Classics of Confucianism, and provided the common source for both Confucianist and Taoist philosophy. Includes an Index. This is the Richard Wilhelm translation from the Chinese into German rendered into English by Cary F. Baynes. (Key Words: Chinese Philosophy, Hellmut Wilhelm, Confucianism, Taoism, China, Carl G. Jung, Wisdom). Hardcover. Octavo. lxii + 740pp. Yellow cloth gilt-lettered on spine. Color fold-out frontis. Index. Fold-out plate at rear. 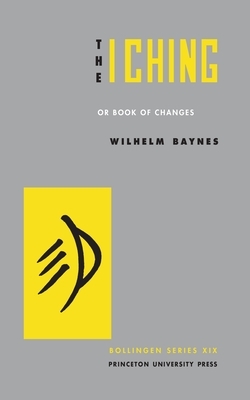 The well known and popular Richard Wilhelm / Cary Baynes edition of the I Ching, with foreword by Jung. Light shelf rubbing, edges a little darkened, bumps to spine ends and corners, owner's gift inscription on front blank, fore-edge of frontis a little chafed at lower corner. Overall a clean VG copy in Good + dust jacket. Very Good. No Dust Jacket. SPIRITUALITY. 12mo-over 6¾"-7¾" tall. (62)740pp + fold-out plate. Indexed. Nicely printed and bound. Very Good-in Good+ dust jacket. 069109750X. Front endpaper missing; DJ edgeworn with missing pieces at edges of spine; 1.8 x 8.1 x 5 Inches; 806 pages. Very Good in Very Good jacket. Book. 8vo-over 7¾-9¾" tall. Publisher's yellow cloth hard covers, in dust jacket. Old owner's bookplate to inside front cover. Clean, tight and unmarked. Very neat--a sound and handsome copy, nearly as new! Fine in Near Fine jacket. Third edition, later printing. 740pp. Fold-out chart in rear. Foreword by C.G. Jung. Preface to the third edition by Hellmut Wilhelm. Fine in near fine lightly edgworn dustwrapper. Bollingen Series XIX. Change; eight lectures on the I ching.